I am just going to come out and say it: I am not a fan of turkey stuffing (or dressing), and neither is my family. Whenever I make stuffing, it sits uneaten at the Thanksgiving table, before banishment to the refrigerator, labeled “leftover,” where it continues to sit for days, forlorn, neglected, and, frankly, wasteful. So, now I don’t make a stuffing for our turkey. Instead, I jam bunches of fresh herbs, such as parsley, thyme, and sage, as well as wedges of lemon or orange in the cavity to provide aroma and moisture while the turkey roasts. For serving, I provide potatoes and a grain dish to balance and fill out the feast. 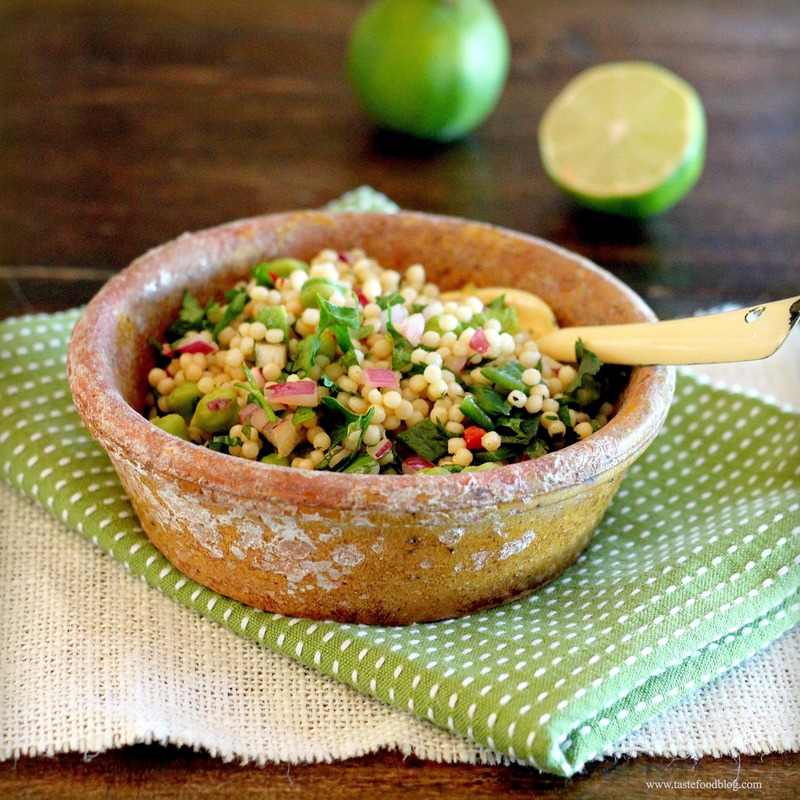 This rice salad is always a hit. It’s a great gluten-free starch substitute for stuffing, and the dried fruit and nuts stud the rice like festive jewelry, providing a pretty addition to the holiday table. Feel free to mix up the fruit and nuts, substituting raisins, chopped prunes, dried figs, walnuts or hazelnuts. For a vegetarian option, substitute vegetable stock or water for the chicken stock. Heat the oil in a medium pot or Dutch oven over medium heat. Add the onion and carrots and saute until they begin to soften, 3 to 4 minutes. Add the rice and garlic and cook, stirring, 1 minute. Add the chicken stock, thyme, salt and black pepper. Bring to a boil, then reduce the heat to low. Cover and simmer until the rice is tender but not mushy, about 45 minutes. Remove from the heat and stir in the dried fruit and pecans while fluffing the rice with a fork. Let stand, partially covered, for 10 minutes. Stir in the parsley and transfer to a serving bowl. Serve warm. Why do I overlook lentils? These humble legumes resembling tiny pancaked pebbles are often bypassed in my pantry, as I reach for rice, farro, couscous. When I finally do cook with lentils, I remember how good they taste, how satisfying they are to eat, and how easy they are to prepare. Imminently flexible, they can stand in for a grain, starch, even a protein. They are healthy too – rich in nutrients, high in protein, iron, and fiber, arguably placing them neck and neck with other lauded superstar foods in the nutrition department. They cook quickly and without any fuss, gamely absorbing the flavors and seasoning from their fellow ingredients and braising liquids, adding a hearty, earthy, and rich base to soups, stews, side dishes, even salads. Really, I must eat more lentils – and you should too. 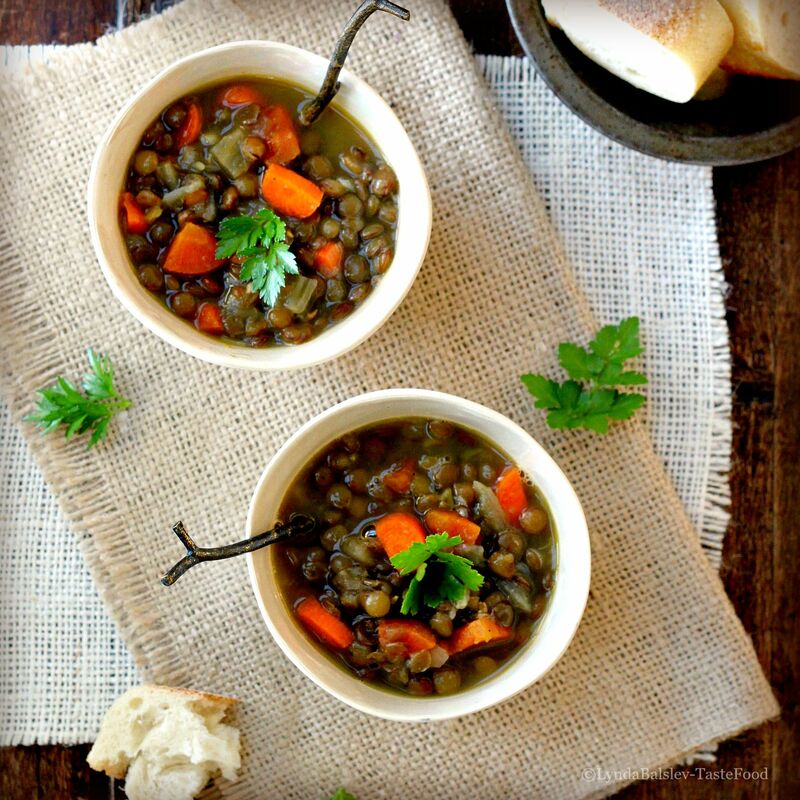 This soup is simple, to the point, and deservedly all about the lentil. Heat the oil in a large pot over medium heat. Add the onion and sauté until softened, about 2 minutes. Add the carrots and garlic and sauté until the carrots begin to soften and brighten in color, about 2 minutes. Add the stock, lentils, bay leaf, and thyme. Bring to a boil, then reduce the heat to a simmer. Cover and cook until the lentils are tender, 30 to 40 minutes. (The soup should be somewhat thick. If desired, thin the soup to your preferred consistency by adding additional chicken stock 1/4 cup at a time.) Stir in the sugar, wine, vinegar, salt, and pepper and taste for seasoning. Simmer the soup, partially covered, over low heat to thoroughly heat through and meld the flavors, 8 to 10 minutes. Taste for seasoning. Ladle into serving bowls and garnish with the parsley. Serve hot. This rice dish is a hearty and flavorful accompaniment to pork, poultry and game. It’s a great addition to the Thanksgiving table, where you might be tempted to call it a stuffing. Dried apricots, cranberries and pecans stud the rice, adding substance, sweetness and festive color. Whether you use it to stuff a bird or simply serve in a bowl as a side, this is a pretty autumn dish. Feel free to mix up the fruit and nuts, substituting raisins, chopped prunes, dried figs, walnuts or hazelnuts. For a vegetarian option, substitute vegetable stock or water for the chicken stock. 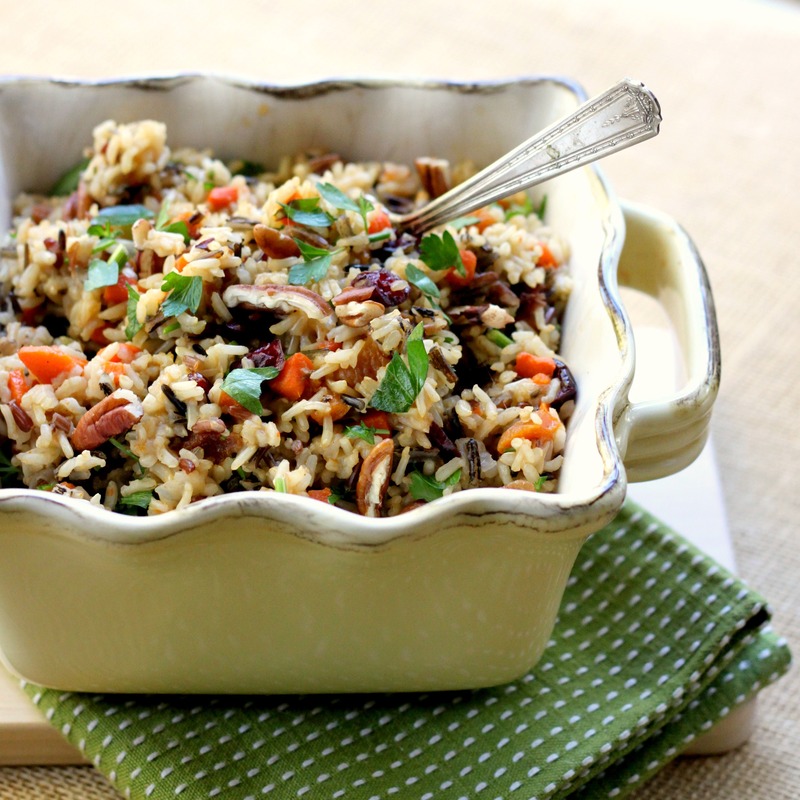 Use all wild rice or a blend of rice. A blend of wild rice, brown rice and red rice is pictured. Serves 6. Heat the oil in a medium pot or Dutch oven over medium heat. Add the onion and carrots and saute until they begin to soften, 3 to 4 minutes. Add the rice and garlic and cook, stirring, 1 minute. Add the chicken stock, thyme, salt and black pepper. Bring to a boil, then reduce heat to low. Cover and simmer until rice is just tender but still firm, about 45 minutes. Add the dried fruit and pecans. Cover and remove from heat. Let stand for 10 minutes. Stir in the parsley and transfer to a serving bowl. Serve warm. I served this Quinoa and Kale Slaw the other night as an accompaniment to grilled pork tenderloin. Quinoa is a hearty, gluten-free grain packed with nutrients. It’s tiny seeds are toothsome and nutty, yet, in my opinion, somewhat wanting for flavor and brightness when served alone. I prefer to tumble the little sprouted grains with a smattering of leaves, chopped vegetables and spices for a healthy and immensely satisfying side dish. 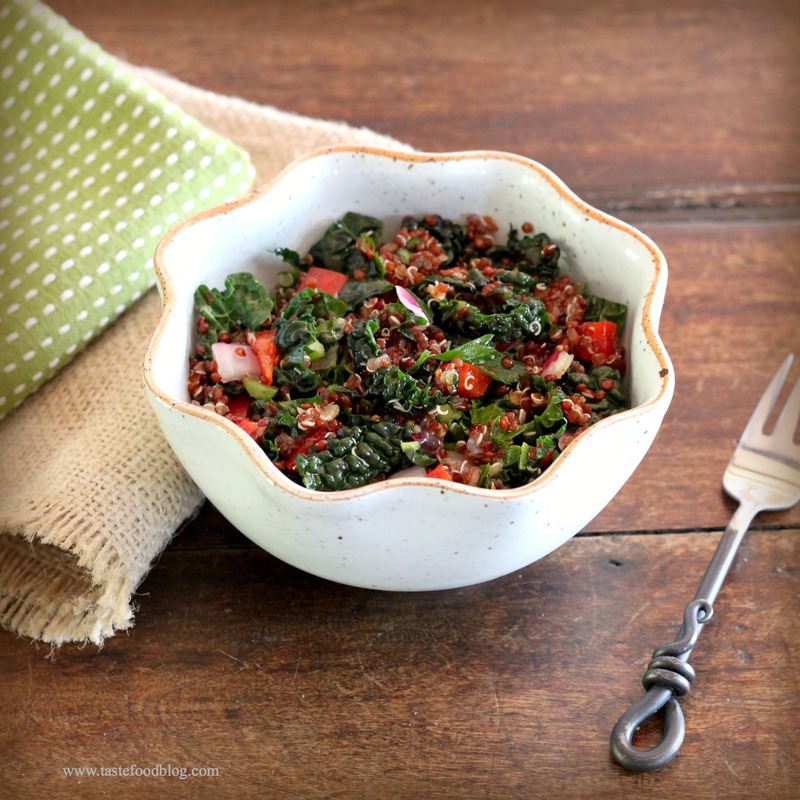 This recipe pairs red quinoa with handfuls of chopped Tuscan kale. 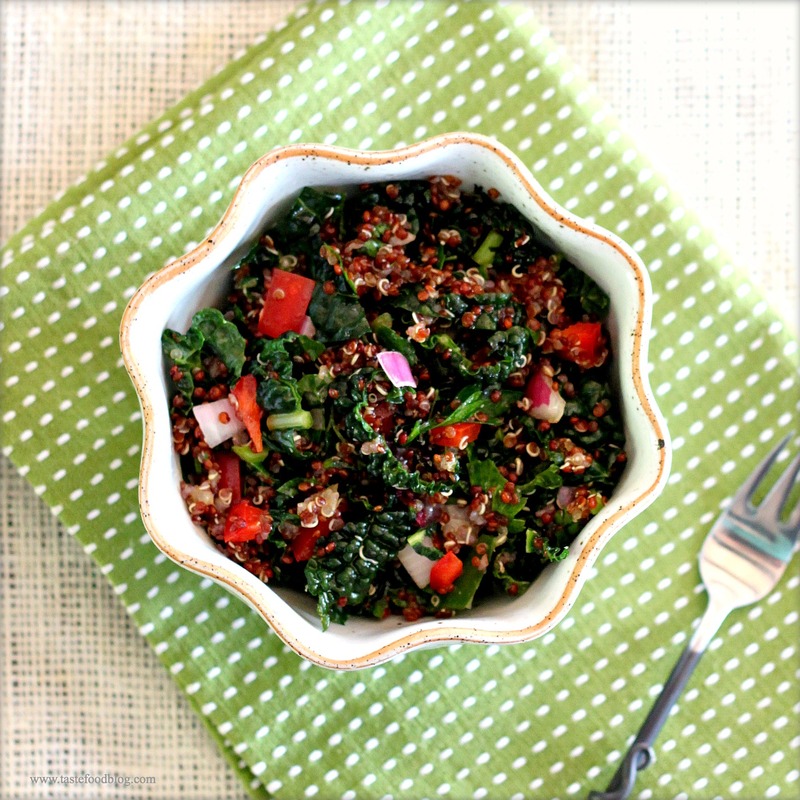 While it may sound like a lot of kale, the sturdy greens easily make themselves at home in the salad and provide a perfect foil to the quinoa seeds. The result is akin to a cole slaw, which, in this case, would be kale slaw. Bring quinoa, stock and 1 teaspoon salt to a boil in a medium saucepan over high heat. Cover and reduce to heat to low. Simmer until liquid is absorbed and quinoa grains sprout, about 20 minutes. Remove from heat. Add lemon juice and olive oil and toss to coat. Cool slightly. Add remaining ingredients, except for the kale, and toss to combine. Stir in the kale. Taste for seasoning. Serve warm or at room temperature.